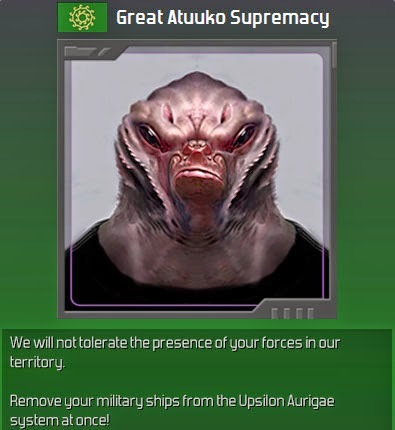 2135.01.25 Olympia’s diplomats decide to ask for peace with the Atuuko (the plan being to renew hostilities as soon as the Elysion Invasion Fleet is ready. But at the last minute, the Olympian diplomats play hardball and demand Atuuko becomes Olympia’s subjugated dominion. To their astonishment, the Atuuko agree! 2135.01.26 Of course, the schizo Atuukos freak out right away. If they try anything, they’re toast. Either way, Olympia is taking Elysion back, whether the Atuukos like it or not. 2135.10.29 After a long time with begin ignored by pirates, Olympia itself comes under attack by the Haunted Prowlers. Nice try. 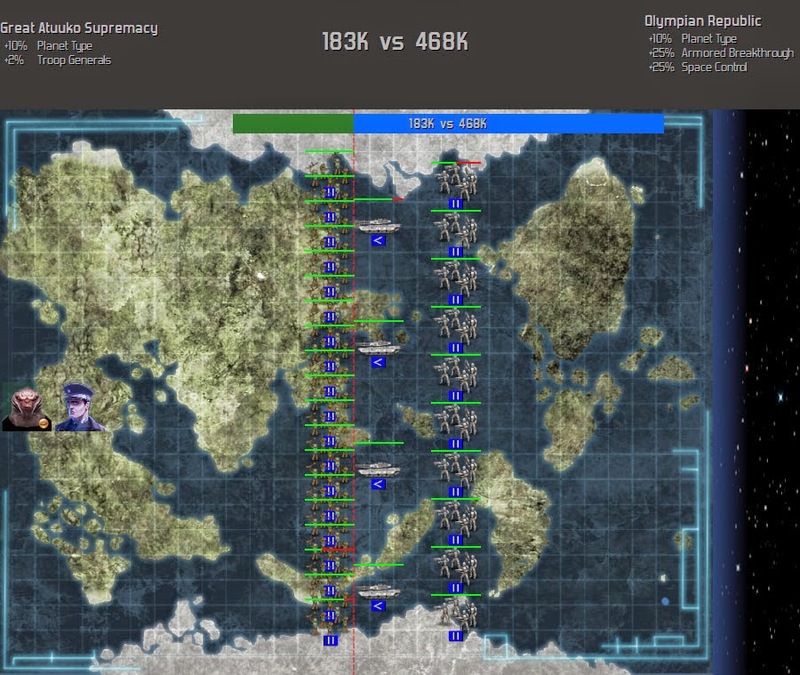 Yet to the President’s intense annoyance, the pirates succeed in raiding Olympia and making off with some technology. 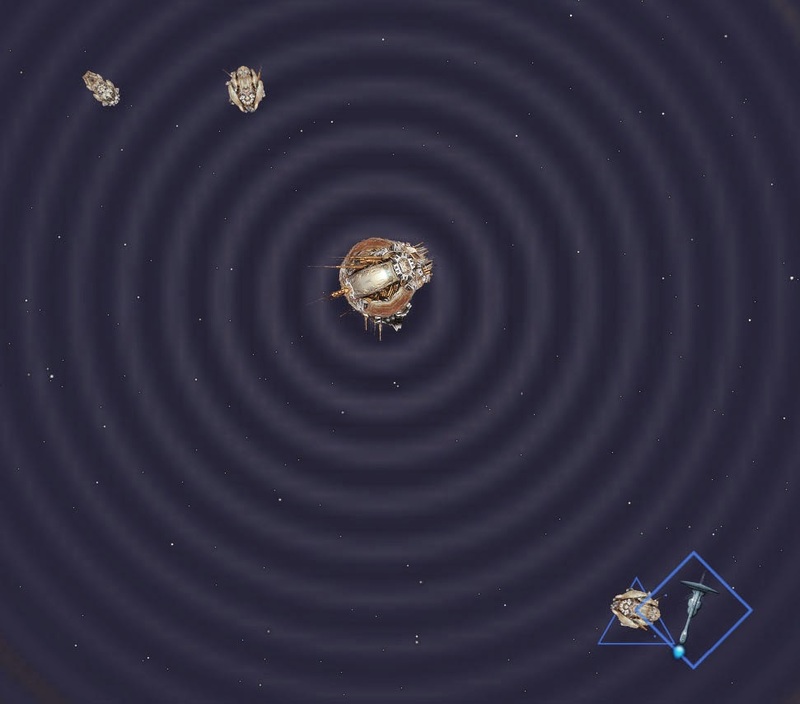 They do not damage the Space Port, but succeed in dropping its shields. They also manage to destroy Sol Technology Research Station. Defenses need to be beefed up a bit. 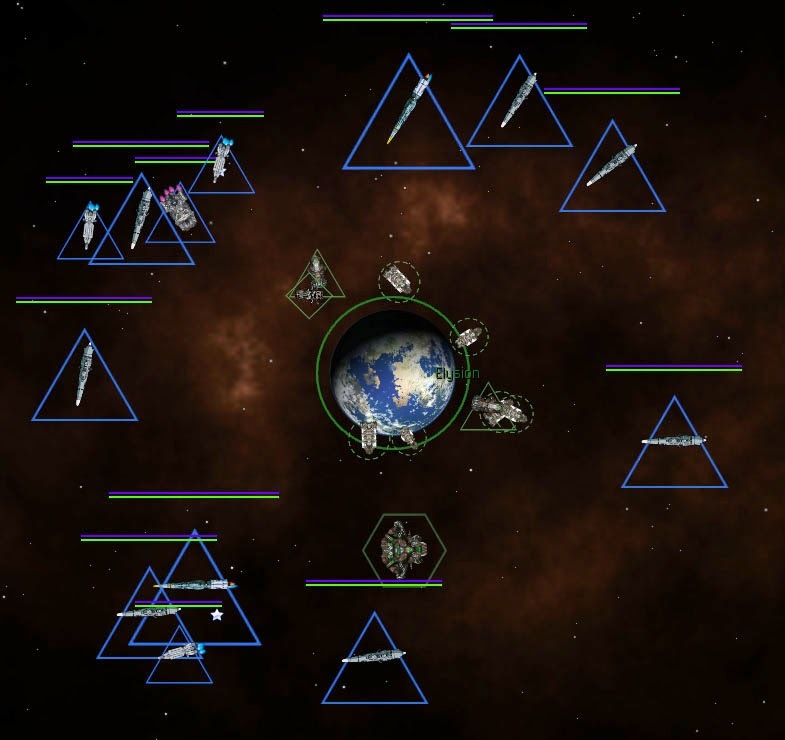 2136.09.05 After some more peace and finagling with how to manage troop loadouts, the Elysion Reclamation Fleet (consisting of 8th Fleet (the combat element) and 5th Fleet (the troop transports)) is ready to go. While this is going on, the Haunted Prowlers have sporadically been attacking Olympia, the fools. 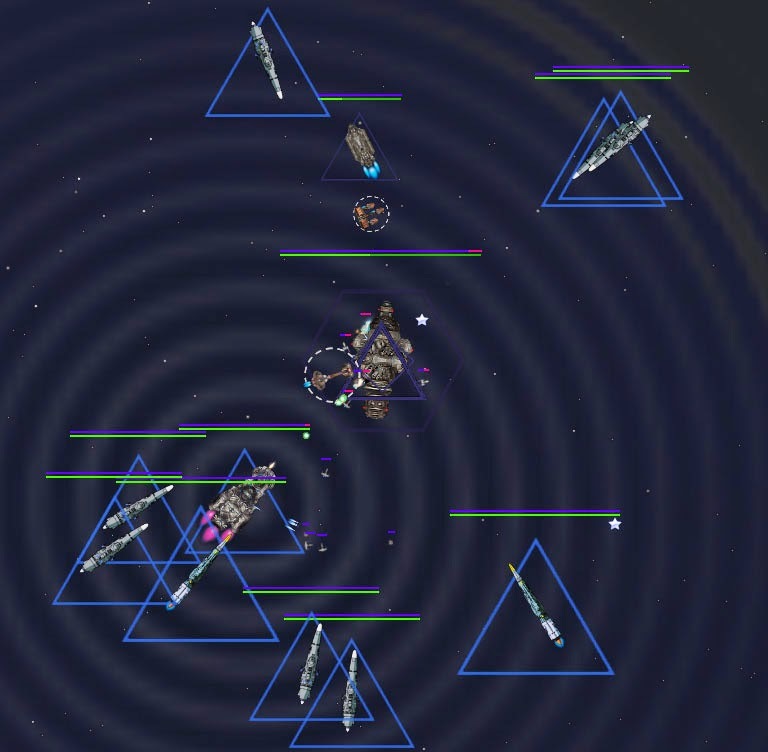 8th Fleet and 5th Fleet converge on Elysion. 2136.12.24 The Fleets rendezvous and the attack is almost ready to proceed. 2137.01.05 The Fleets are in position. The order is given, and war is declared. 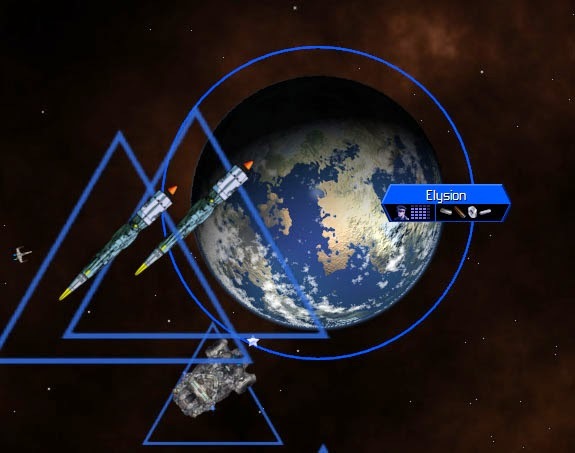 The Atuuko Defensive Base at Elysion does not have its shields or weapons online yet, and falls easily. 2137.02.24 At this time Agent Tarfan, Olympia’s Espionage Ace, is sent on a super-secret mission that should take a year to complete. The instant Elysion is liberated, Olympia demands Atuuko become a Subjugated Dominion, and they readily agree. 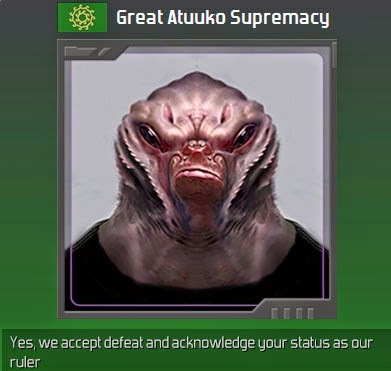 The Atuuko never engaged in any serious offensive action in this mini-war. Now that the war is over, full attention can be paid to helping the economy. 2137.09.28 The 7th Fleet, consisting of four older ships, is sent to retire. 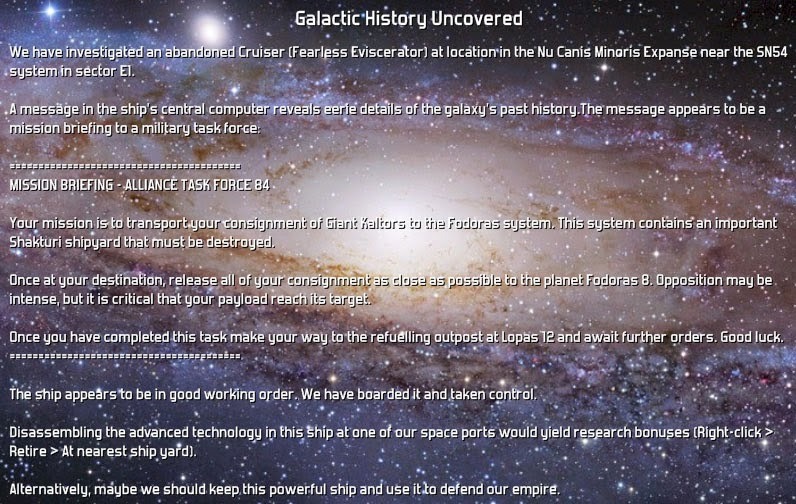 2138.01.01 With the new year, EX-04 is ordered to explore the Archive Refuge at Xi Tucanae. 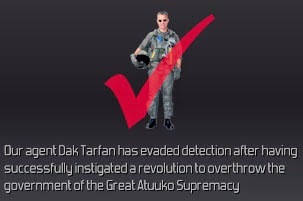 President Dak Undulian is an engineer, and as such he recognizes a better design when he sees one. After releasing the information about the Way of the Ancients to the people of the Republic, a peaceful revolution takes place, and the Olympian Republic is replaced by the Olympian Way. The rest of the year is peaceful, and the Olympian Way’s economy quickly begins to boom. The Navy, which was going to have to undergo a massive drawdown to keep Olympia solvent, isn’t quite so expensive to maintain anymore. Suddenly all of the foreign entanglements do not seem as frightening. While Olympia certainly does not want to start bullying other empires, it feels that it should not allow itself to be bullied either. 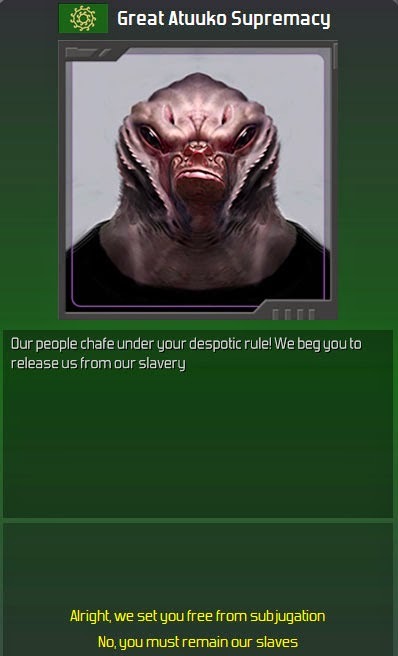 Diplomats suggest trade sanctions against the Naxxilians. The President declines. While the Naxxilians covet Olympia’s colonies, the relationship is still good, and he sees no reason to impose trade sanctions. The Dhayu, on the other hand, are angry, disliking Olympia and also covetous, and so when the diplomats suggest trade sanctions, the President agrees. 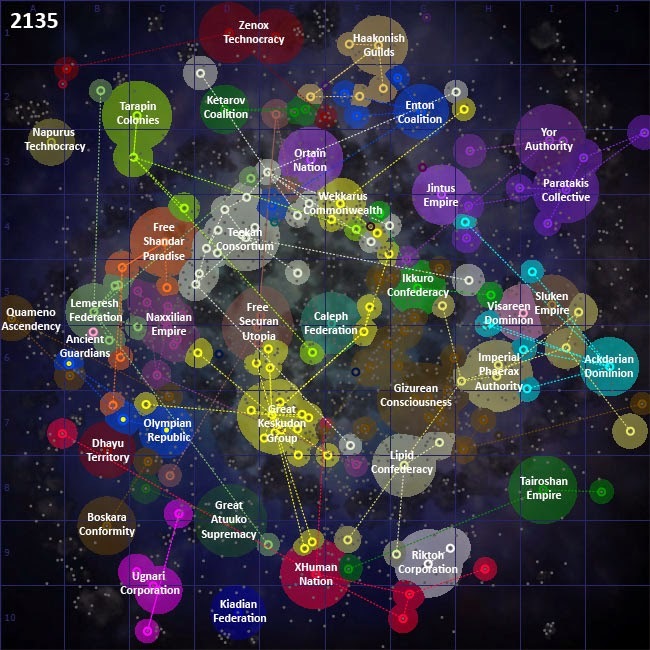 2139.01.01 The next several months are spent monitoring the economy and exploring previously ignored parts of the galaxy. 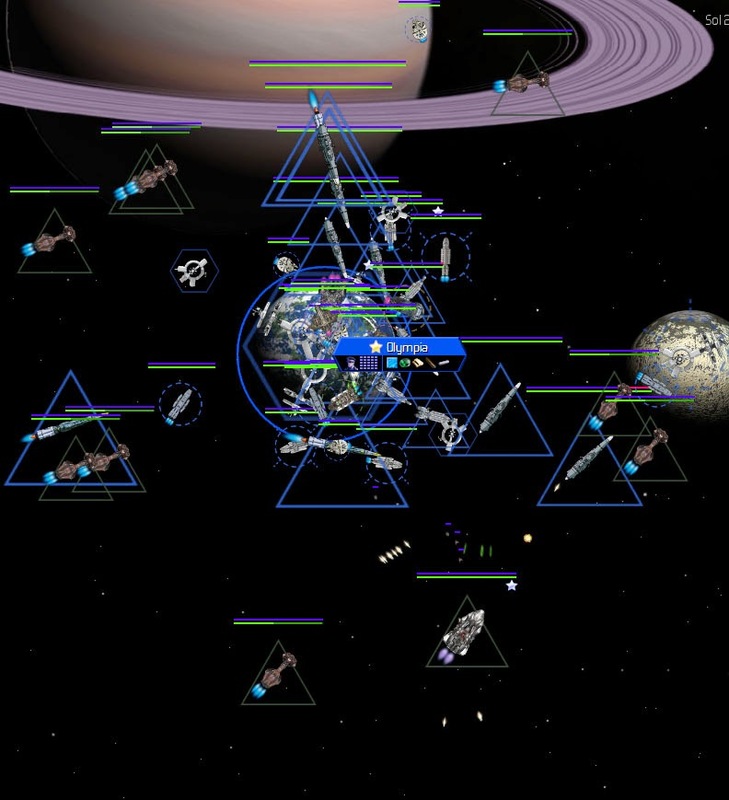 2139.08.10 3rd Fleet is sent to kill some pirates. 2139.08.16 The Kiadian Federation proposes a Mutual Defense Pact, and Olympia accepts. 2139.08.30 The Atuuko Supremacy asks to be freed from paying tribute. Feeling magnanimous with its new form of government, Olympia agrees.